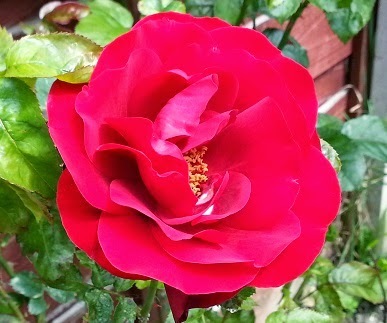 I think it is June, that's what the calendar says. 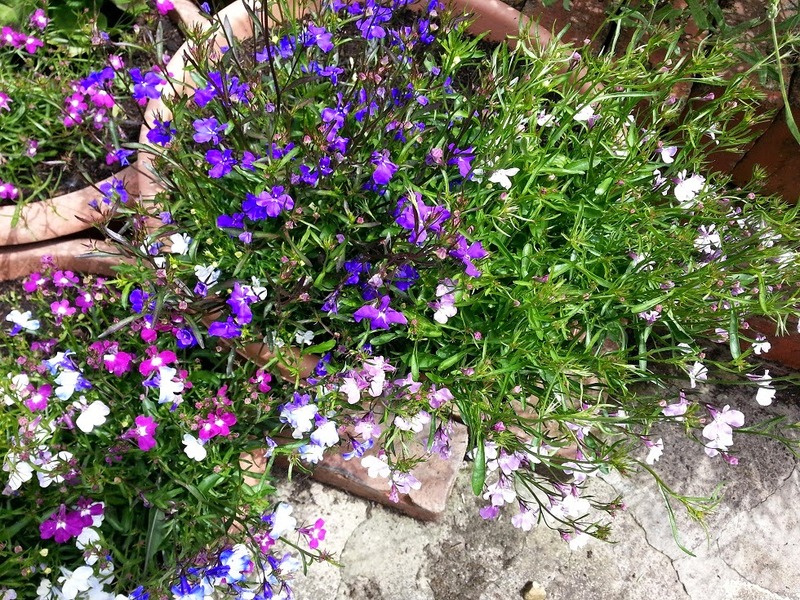 It has been so cold and wet here that I could be forgiven for the confusion, it is more like March than June. I can't say that I mind too much, it is an excuse to stay indoors letting the garden grow itself into a mess of dandelions and moss. 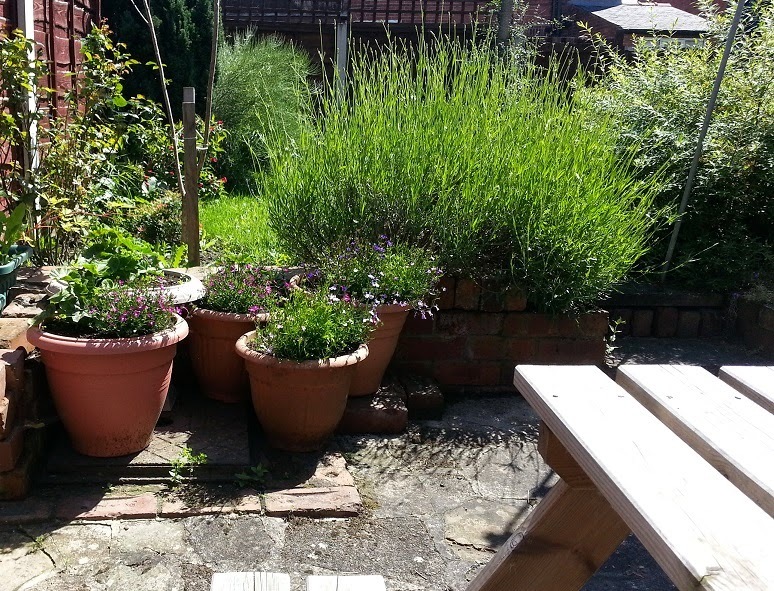 Nothing I can do, it's the wrong weather for gardening :) Well that's my excuse. I mentioned a week or so back that I wanted to make some amigurumi and today seemed like the perfect time to put my feet up while the rain came down outside and make something 3D! 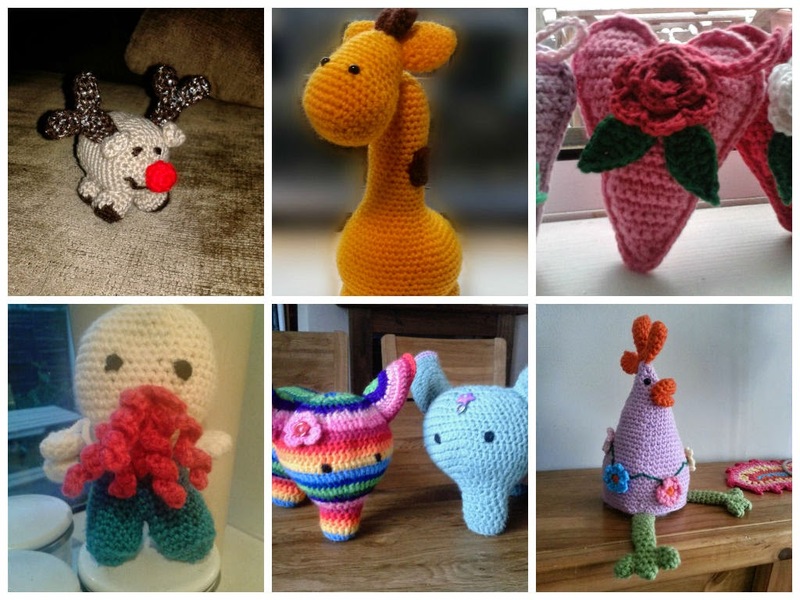 Amigurumi is the name given to any crocheted animals, toys etc and is usually all made in double crochet in a spiral with a stitch marker. 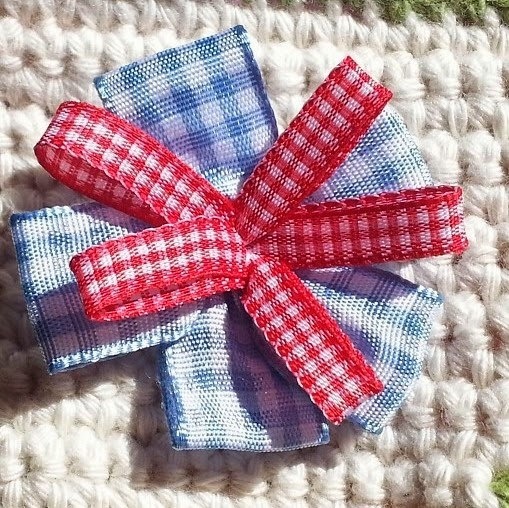 There are thousands of free patterns out there for amigurumi, many of which are on my list of 'might tries' but I fancied having a go at making one of my very own. I have avoided making anything three dimensional lately as I am running out of places to put things! 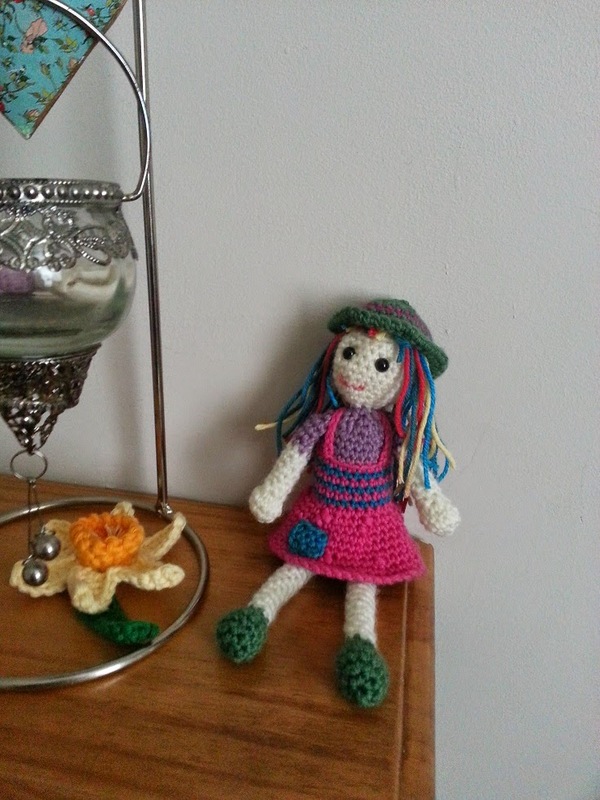 So it had to be kept fairly small, I wanted to make a doll/elf/fairy/girl shaped thing and I was going to use Drops Cotton Merino as I love the colours and it is so nice to work with. I love her stripy draws! I constructed her so that she needed the minimum amount of sewing, all the stripes are done in spirals so there aren't hundreds of ends to sew in and even the legs and skirt are all crocheted on. 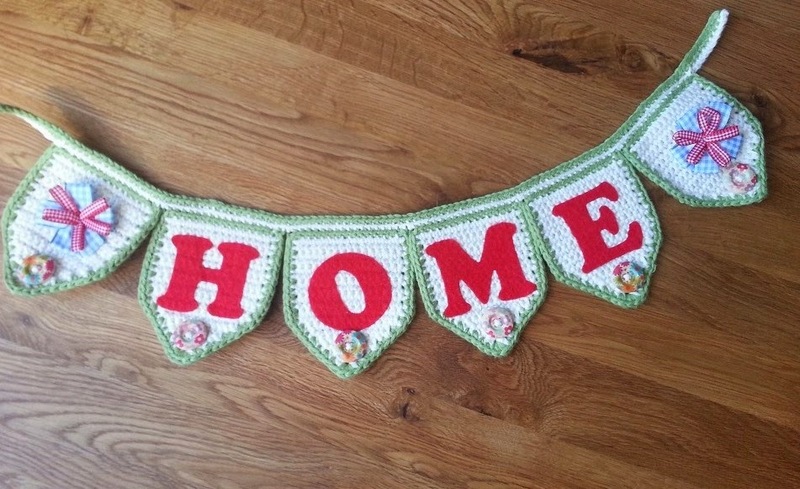 Oh it is good to finish crocheting something and not be left with an hour or two of sewing! She has found a home on the end of the mantelpiece, she might not stay there but she looks comfy for now. 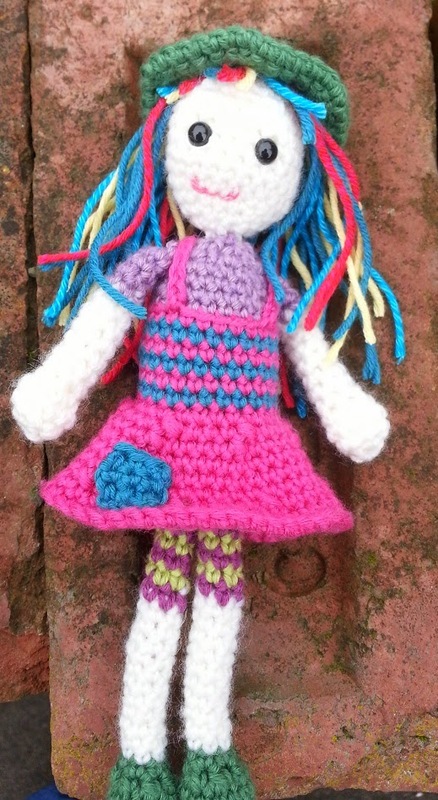 Her hair was the last thing I did, I wasn't sure how to do it or what colour so I decided to sew on lots of colours and see what happened, I think she turned out quite pretty! I am going to have to think of a name for her though, 'Dolly' is a bit boring. She is a rough draft but I do want to make some more like her. 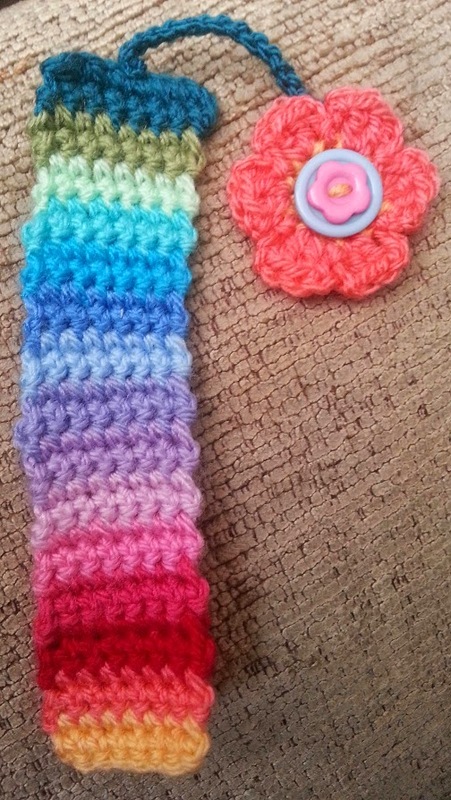 I would like to share the pattern with you but as I didn't take any notes (again) I will have to make another one before I can tell you how to make one as I'm not 100% sure myself. 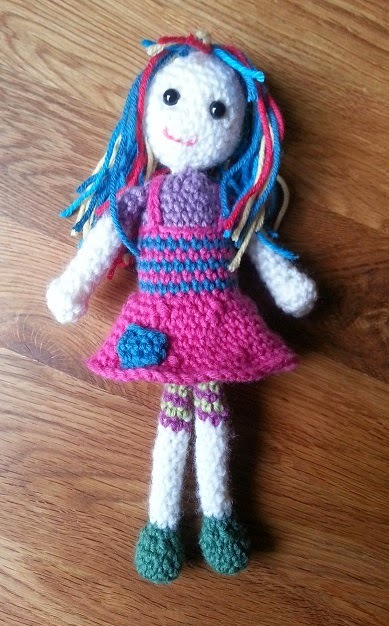 I can see this basic dolly pattern adapted to all sorts of things, fairies, pixies, witches and elves. This week has been all about getting a job. Not that I have one yet but I can feel one looming! 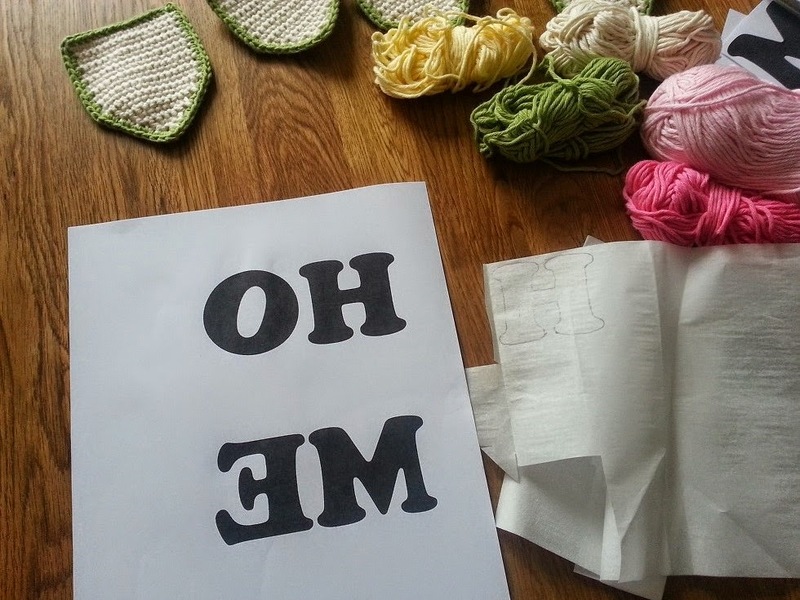 Don't get me wrong, I have no problem working and as Mr Drops and Debbie Bliss haven't yet hunted me down to be a chief yarn tester, I am going to have to go back to the world of the employed in the near future. I can't help feeling a little bit sad that I will have to give up my days of endless hooky. 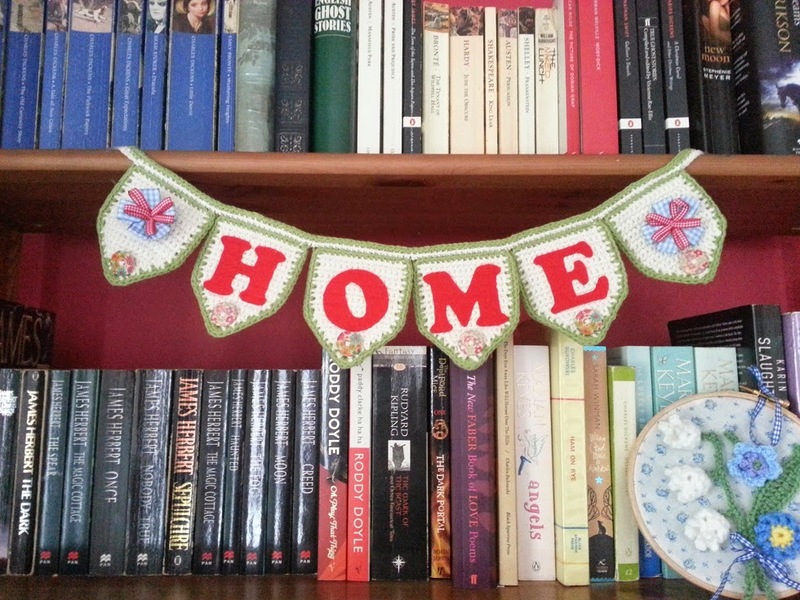 Alas I don't think I can get away with having my own granny bunting strung up downstairs, maybe something for the spare room if I ever get it decorated. 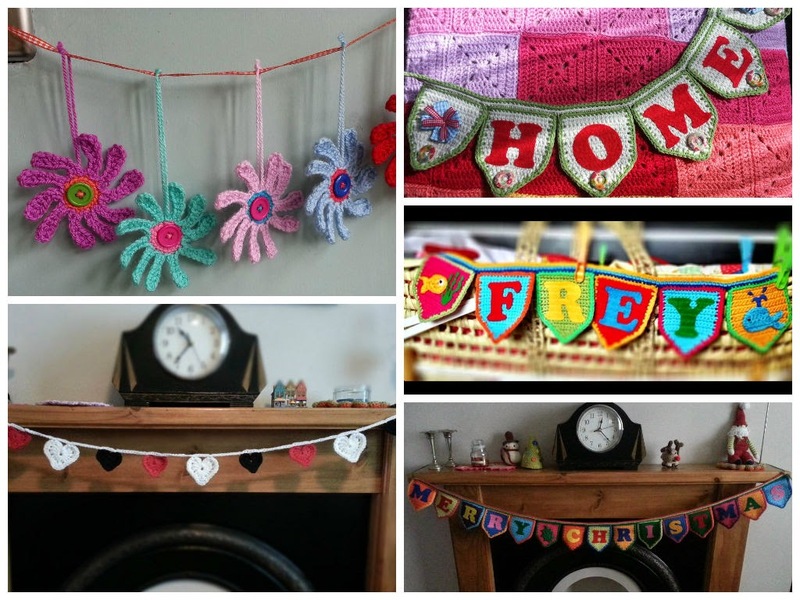 You might have noticed that I love a bit of bunting! 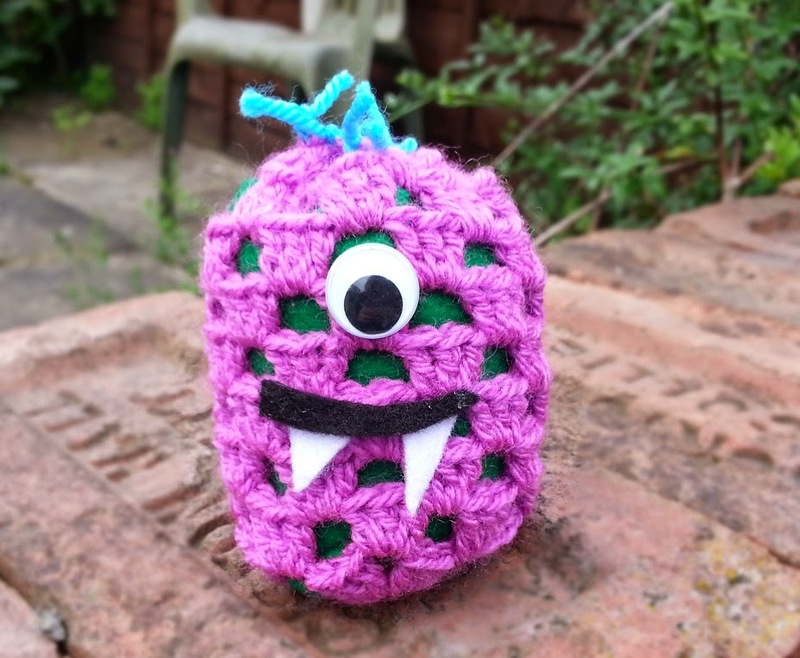 I have also been mucking around with granny squares and came up with this little fella I am calling my Monster Granny! 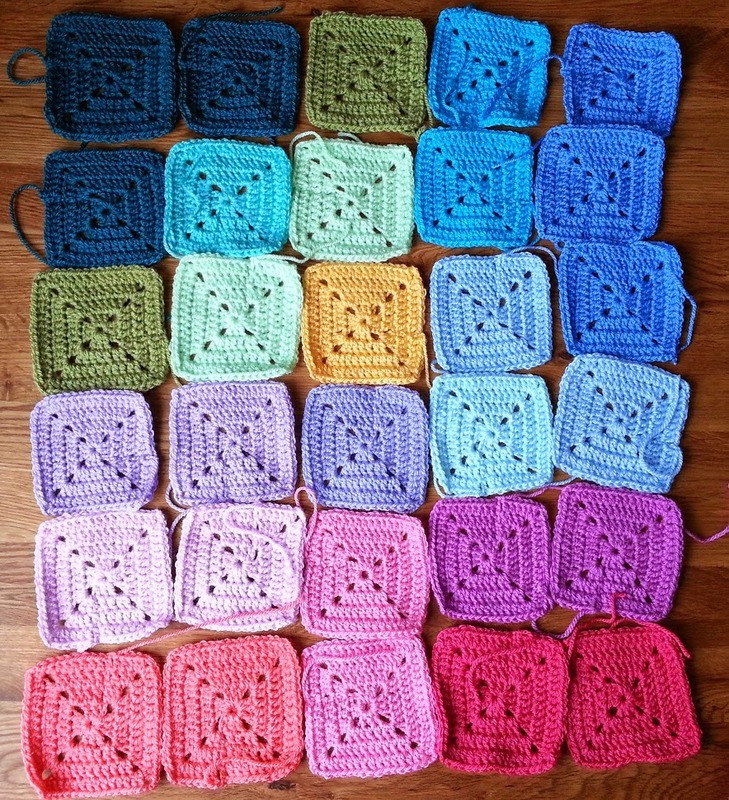 This is a very simple variation on the humble granny square. 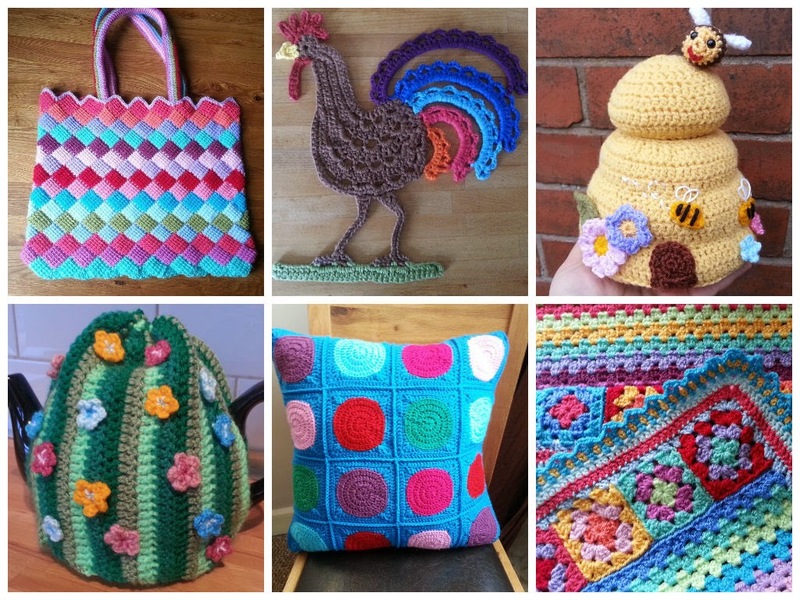 I thought it was quite a fun little thing to make for beginners and children who are learning how to crochet so I have written the pattern up with a few photos and it is available under 'Patterns' on the left sidebar. He just sort of happened, I found a couple of googly eyes in my purse that I can't remember buying (does anyone else have googly eyes lurking in their purse or is it just me?) and he quickly evolved from there. Where has the time gone? 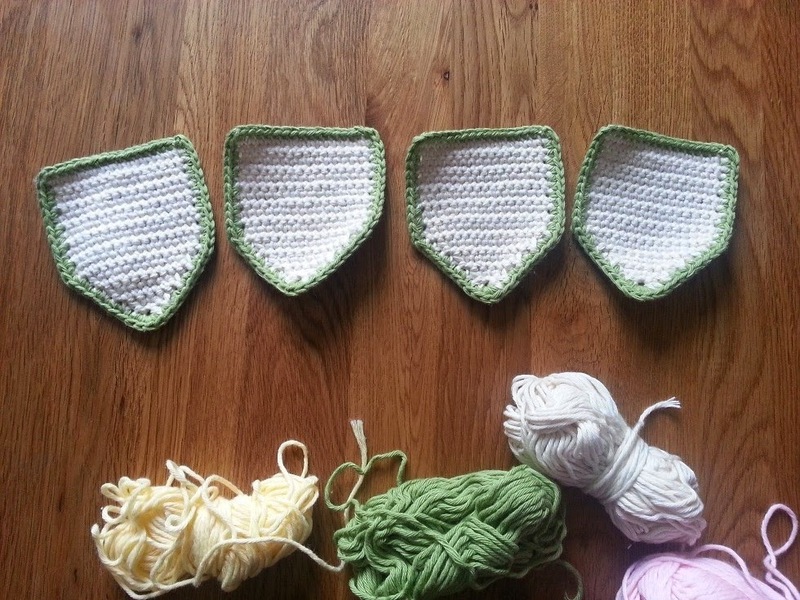 I sat down at around lunch time to try and write a pattern and three hours just went in one giant slurp! I think I must have got lost in the sums and picture editing - little things that seem to take a long time and I'm only half way through! 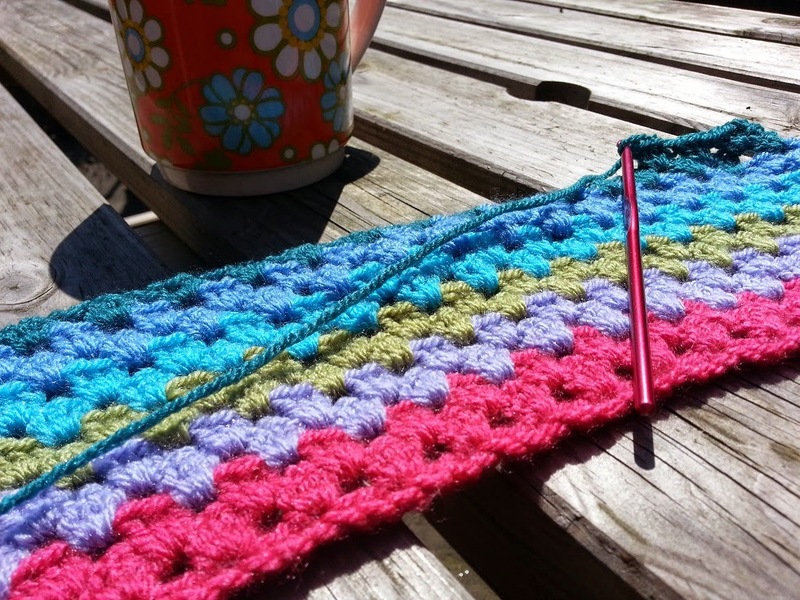 This is time I would much rather have spent crocheting as yesterday I started my new blanket and I just can't wait to really get on with it. 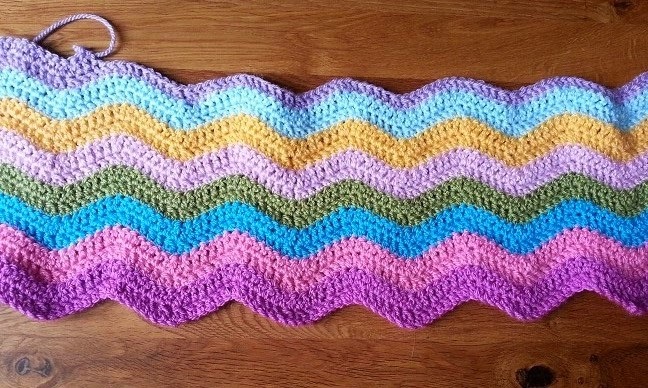 Don't get me wrong, I do enjoy writing patterns but you can't beat a bit of rippling!!! I just couldn't help myself, it had to be a ripple. 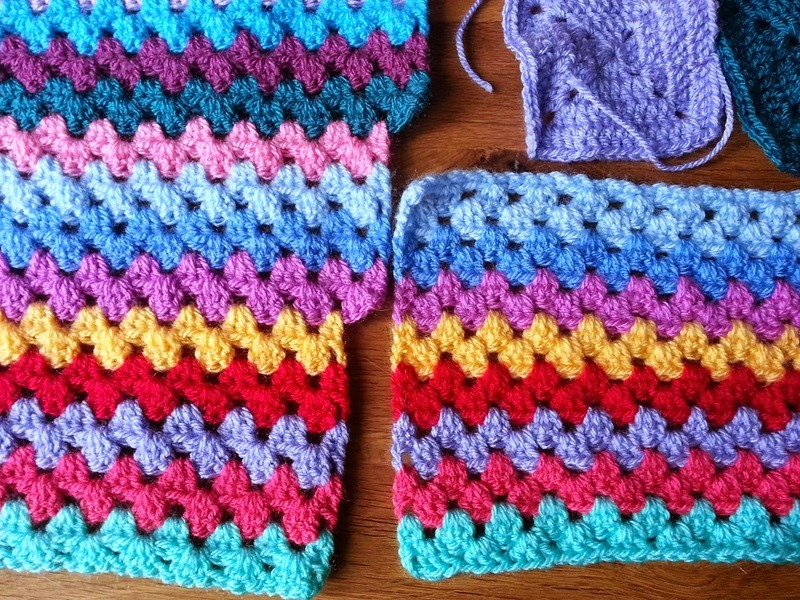 The pattern is easy to remember and repetitive but with just enough interest to not be boring to do, it really is very therapeutic. 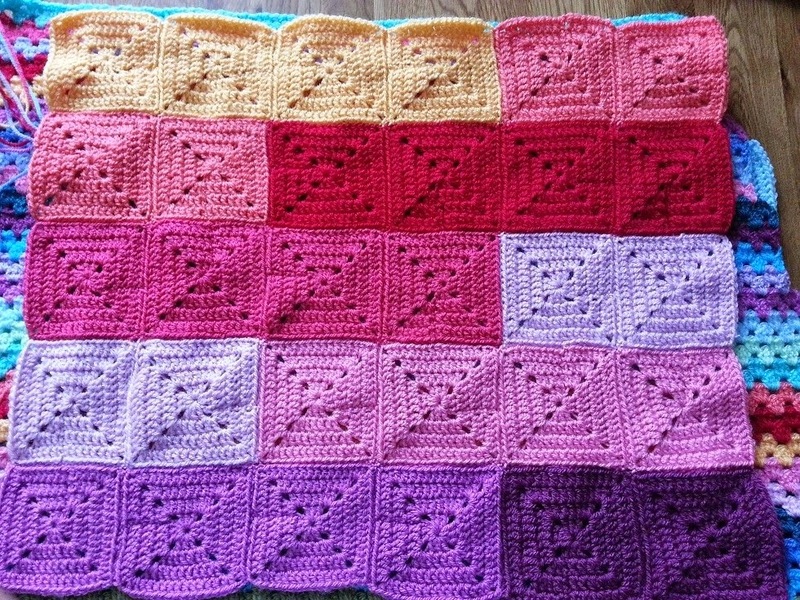 This is not just going to be a ripple blanket, I am going to make a kind of sampler made up of all different things. 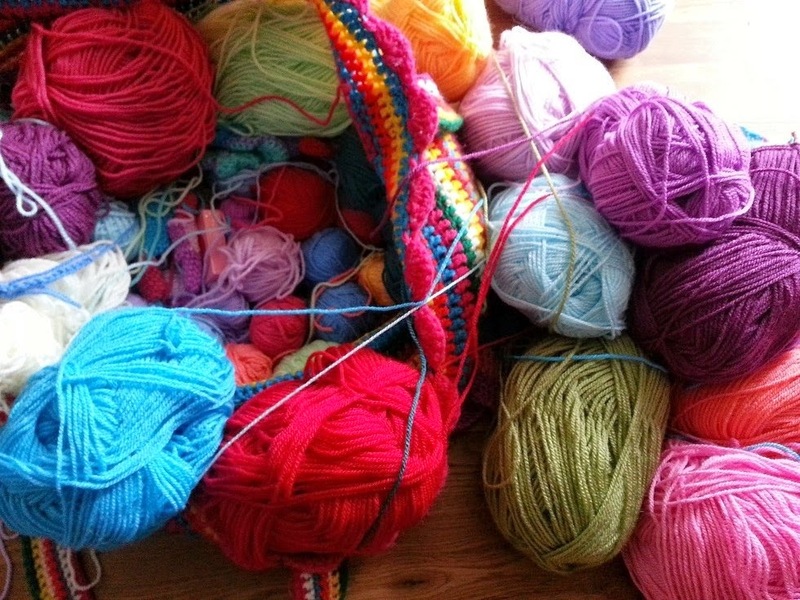 I have visions of circle-squares, granny stripes, hearts and flowers all coming together in one big wooly explosion of colour. 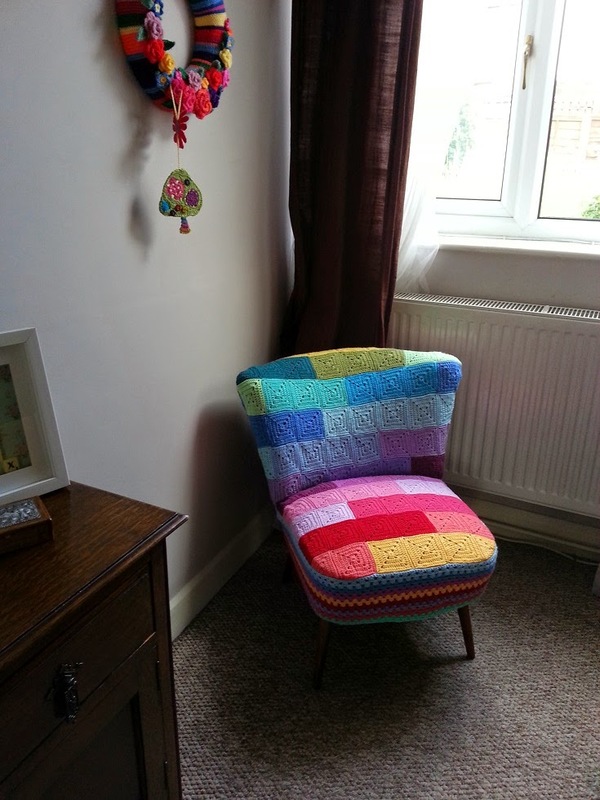 I am using the old faithful stylecraft special dk as I have tonnes of it left over from the load I got to do the Granny Chair. hmm needs a bit of a tidy-up. It is going to take a while to do, I have no real plan but intend to fall back on the make-it-up-as-you-go-and-hope-for-the-best technique. 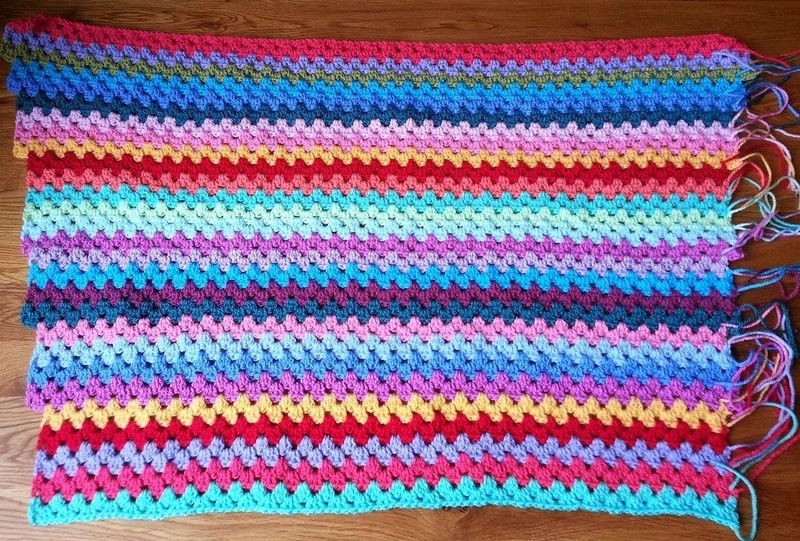 I love starting a new blanket, a proper big one that is going to take ages, no rush, no deadline just always there to pick up and do a bit, between other things - simple, mindless crochet. 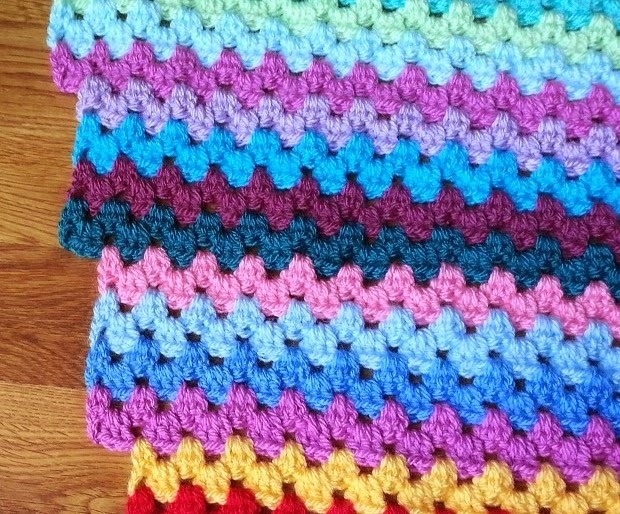 So while all those blanket ideas are bubbling away I will get back to these patterns which hopefully I will be able to share with you soon. 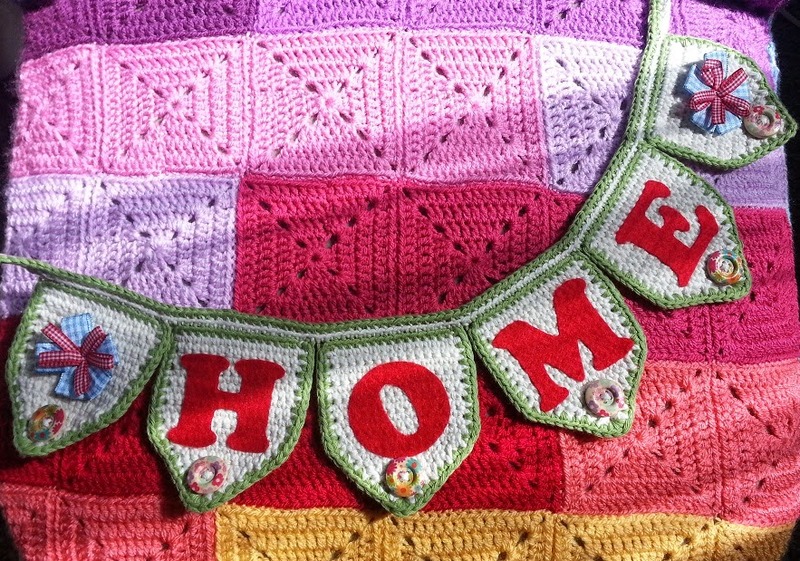 It's been fairly quiet on the crochet front this week for me. 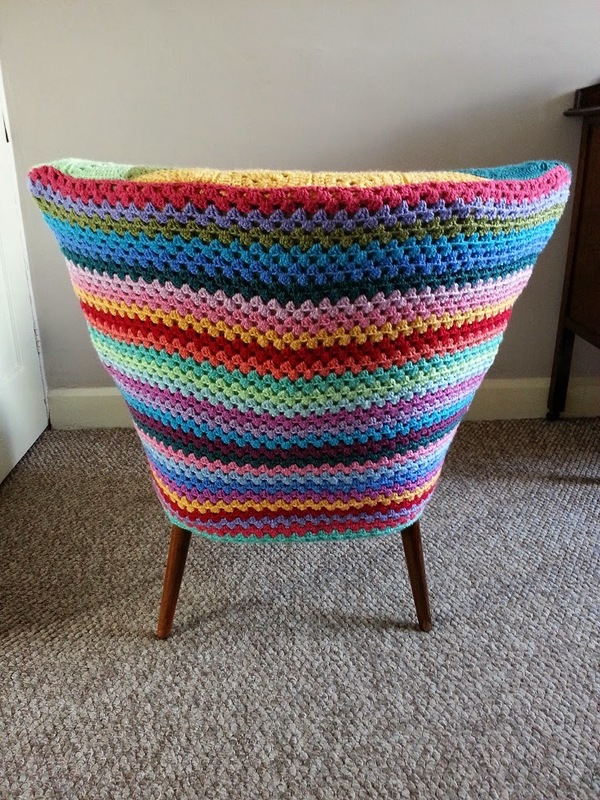 With my Granny Chair all finished I have been looking around for something new to get my teeth (and hook) into. 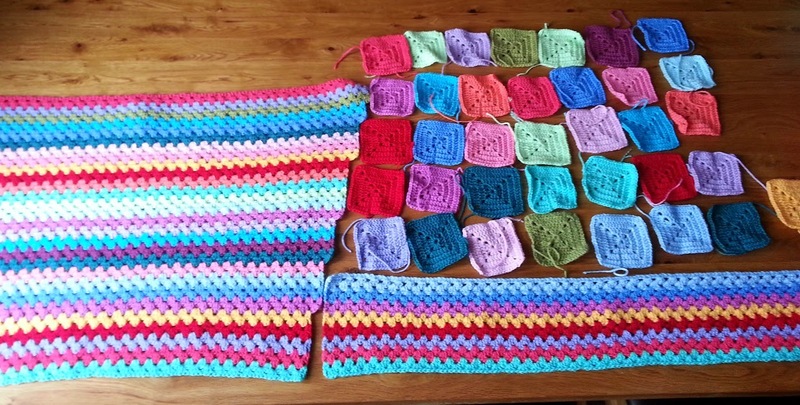 I am taking my time, weighing up the options; blanket, cushion, bag, cardy, more yarnbombing or something altogether different. 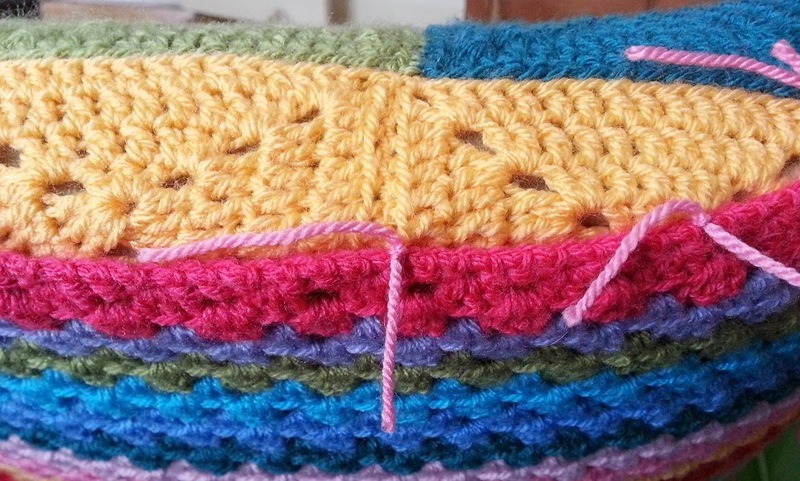 My bag of stylecraft has been sat next to my usual sofa spot since finishing the chair so I have been picking up different colours and seeing what happens while I mull over all the other possibilities. 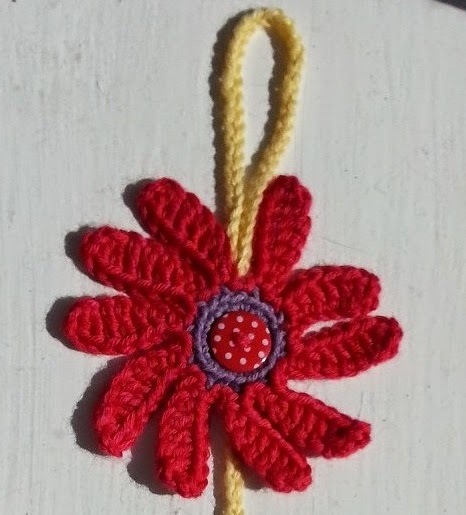 I liked that flower so much I wanted to replicate it and write down the pattern in case I ever need it again. 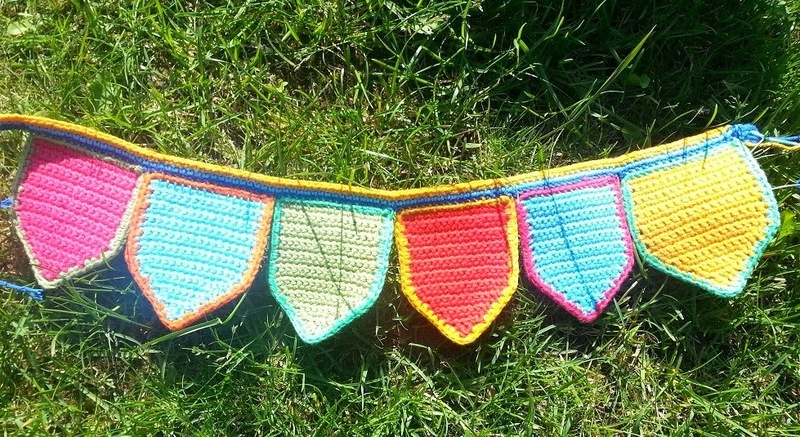 The pattern is on the left side-bar so you can make one too! I am absolutely delighted that some of you have already had a bash at these with some fantastic results. I love seeing the pictures so please do send me them if you make anything of mine. 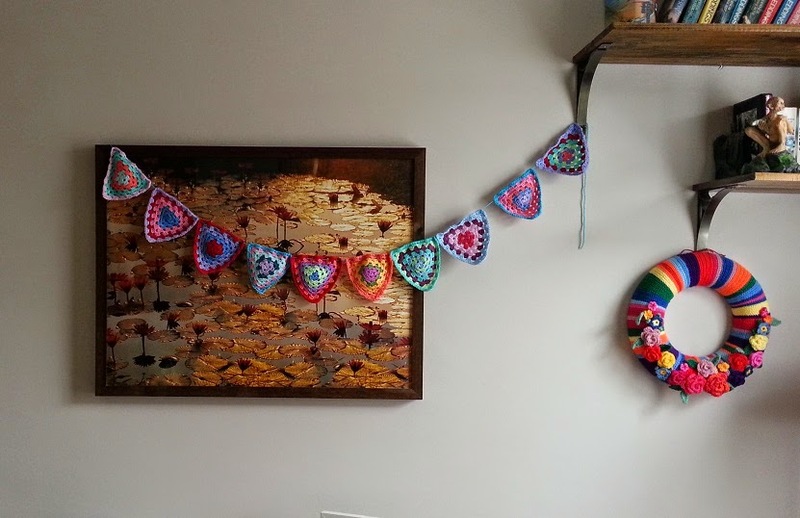 When I finally get around to decorating our spare room (more commonly known as 'Abi's yarn dump') I will hang these up in there along with all the other little hangy bits that I have made over the last couple of years. Simple but sweet and more than that, useful! I never have a bookmark when I need one and all my Harry Potter's are falling apart with being laid open face-down. Alas it may be too late for them but hopefully this will help prevent the same damage happening to my other books. It has been an epic weekend of sewing, sewing and more sewing but the final stitch has just been made so I can at last see if my imagination matches the reality of what I have made. 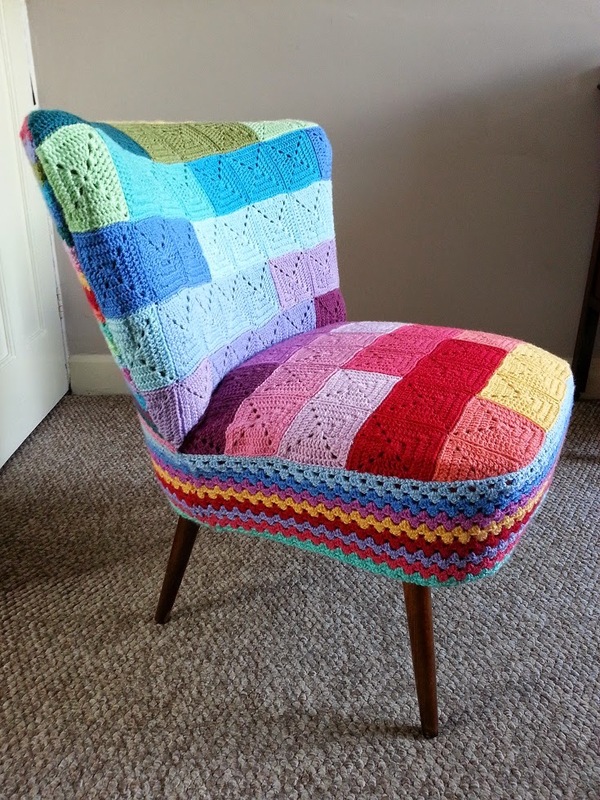 For those of you that aren't up to speed with this latest project, I acquired an old nursery chair that used to belong to my Granny. 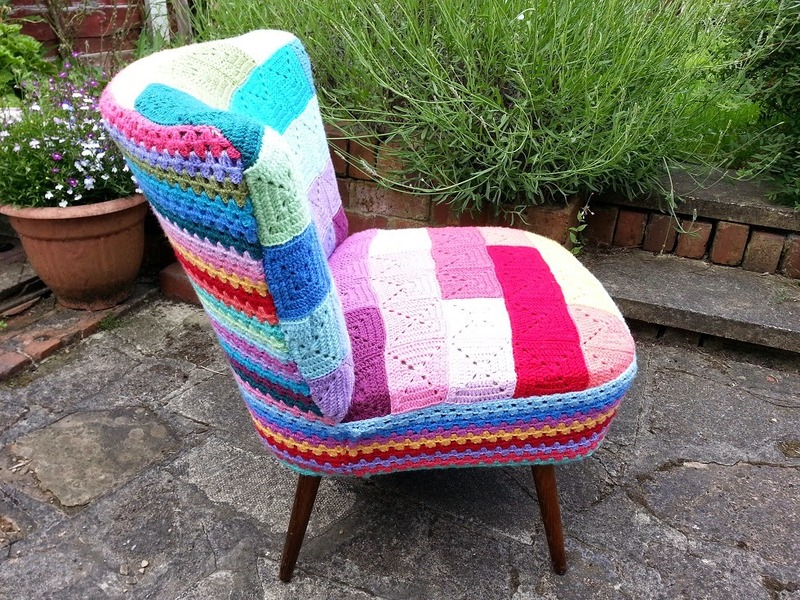 It really was not my cup of tea in the pale green that it had been upholstered in, but I absolutely loved this chair; the childhood memories and the shape of it, so I decided to make a new covering and of course that meant a lot of crocheting! At first I had ideas of random different coloured squares in a patchwork effect, this soon evolved into putting the colours in a graduated spectrum because I just love them like that. 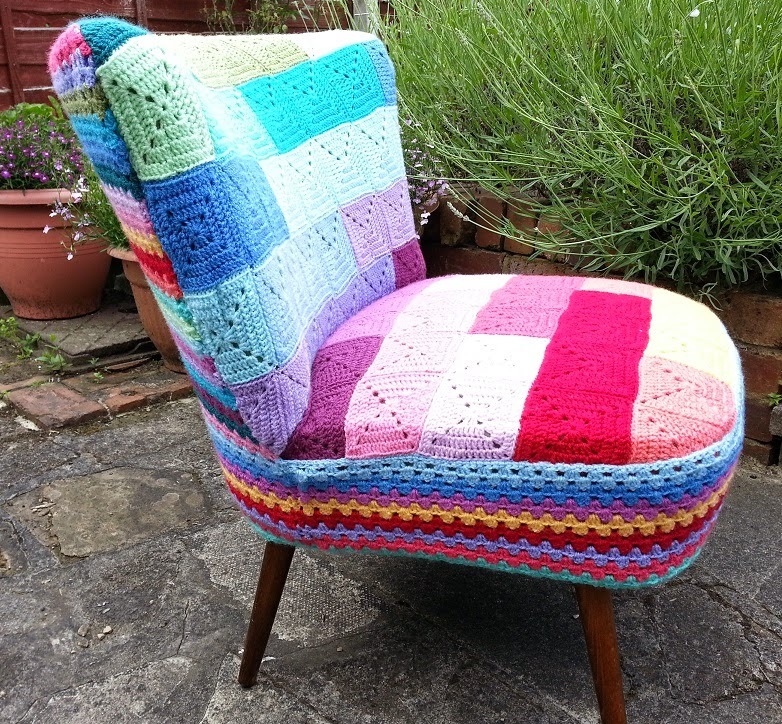 The back and the bottom of the chair needed covering too and I settled on a good old fashioned granny stripe for that. The main reason for that choice was it seemed like the easiest way to get the shape I needed. Just wonderful. But was it? 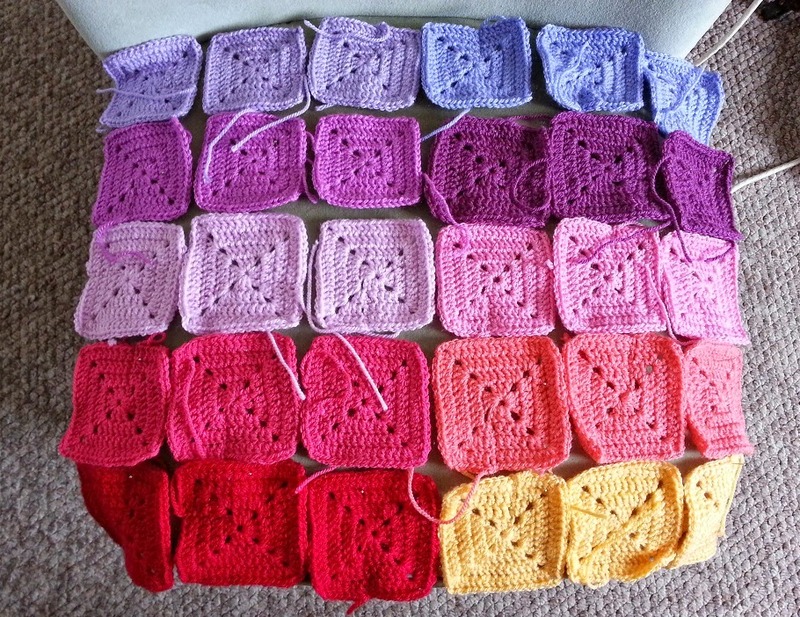 There is no denying that the squares look good but would they go with the random granny stripes that I had knocked up for the rest of the covering? Last night I was extremely close to throwing the stripy bits away and making new stripes, in a less random colour progression. That seemed like such a waste though so I decided to just sew up what I had and if it didn't work I would just make another covering. It was also at this point that I started to get worried about having shared all the updates so far. 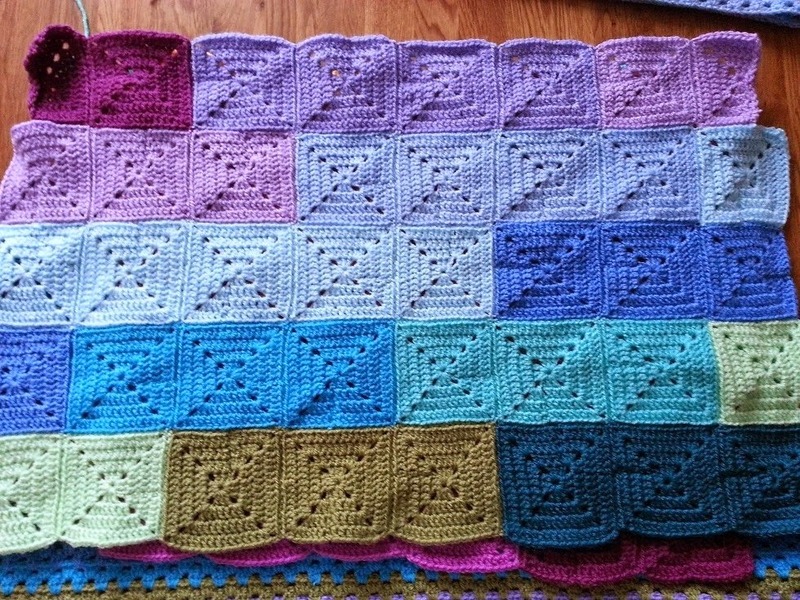 I wished I had kept it a secret until it was finished, just in case it turned out horribly! 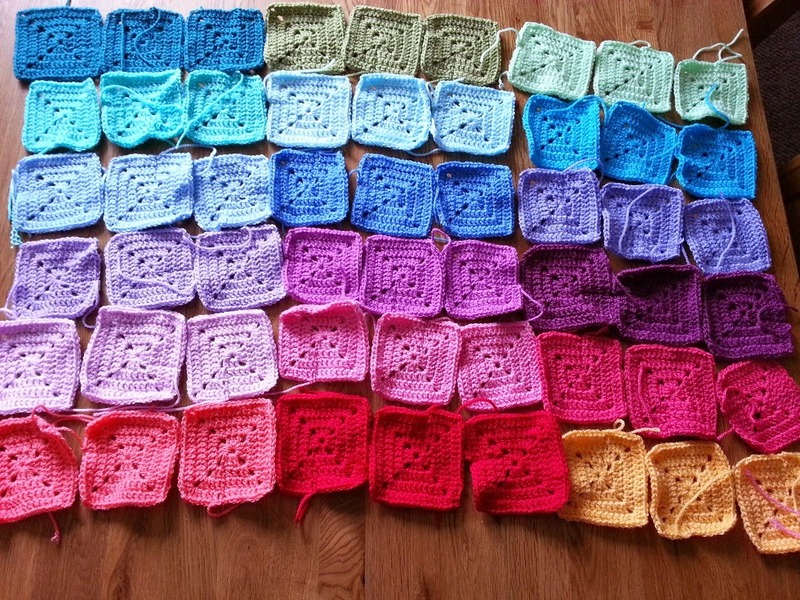 That isn't what my crochet is about though, it's as much about the process as it is about the end result. Part of that process was putting all the parts together, definitely not as much fun as crocheting but necessary. 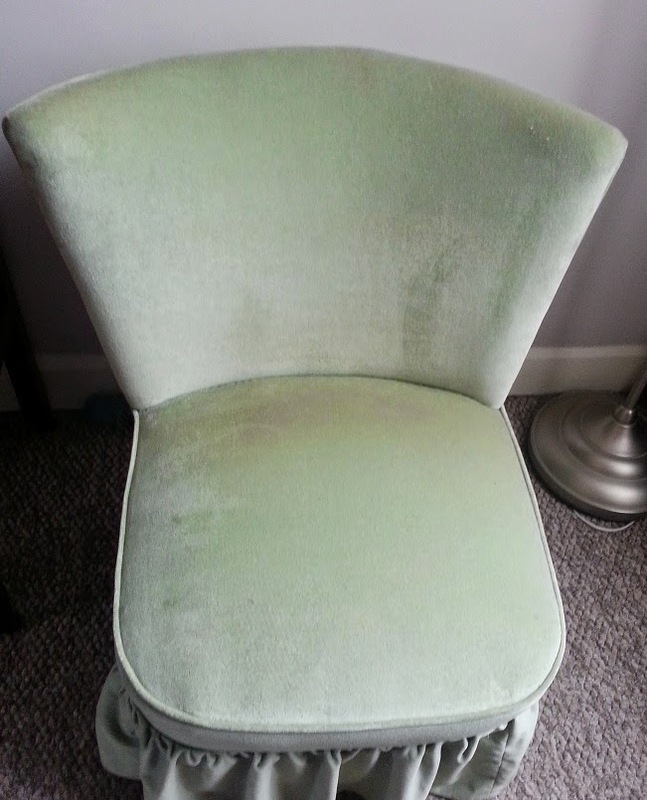 Throughout the entire construction of the chair cover I have been measuring it against the chair, making adjustments and seeing how it would work and what I needed to do to make it work. This has involved a lot of pinning, taking it apart, re-pinning and so on. Unfortunately pins don't hold too well with woolly things so for the actual sewing up process I found that making tacks all around the edges, where they had to be sewn together, was the only way of holding all the parts in place. I started sewing the seat cover to the bottom stripey piece last night and got across one square and realised I had to stop, my eyes had finally stopped working properly after all the square-sewing and I was ruining all my hard work through impatience to get it finished. Bright and early this morning (with both eyes working as well as they can) I got going again and oh my word it was worth it! All my worries about it not looking good enough or the stripes not working with the squares are gone and well, it looks even better than it did in my imagination. 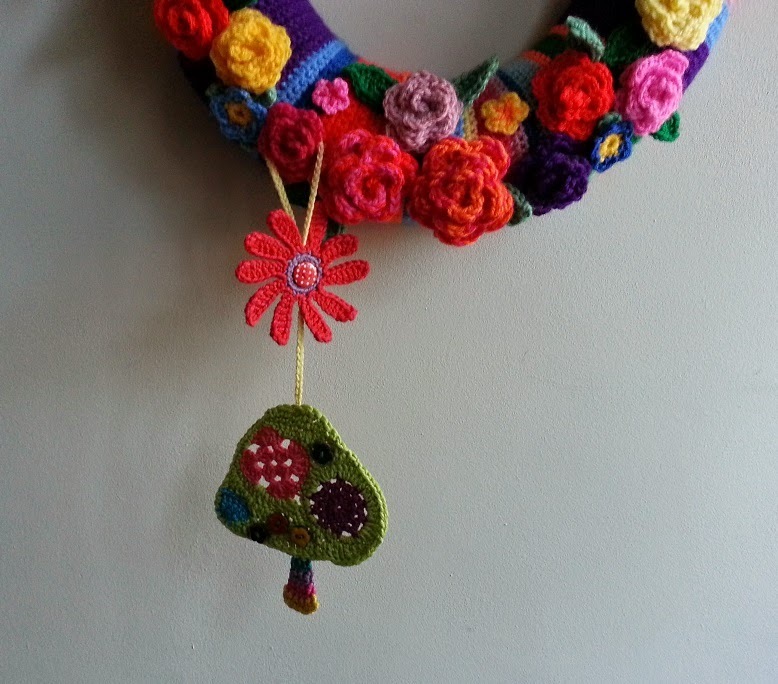 I've got yarn-bombing fever, I am now looking around the house trying to think of what I can give the cheerful woolly treatment next! 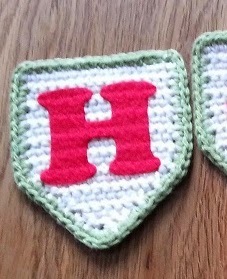 Although I do think I need a break from this type of haphazard crochet and want to make something repetitive that doesn't require a lot of thought, just hooky. I've been working to strict patterns lately - mainly stripes and squares and I really needed a break from it. 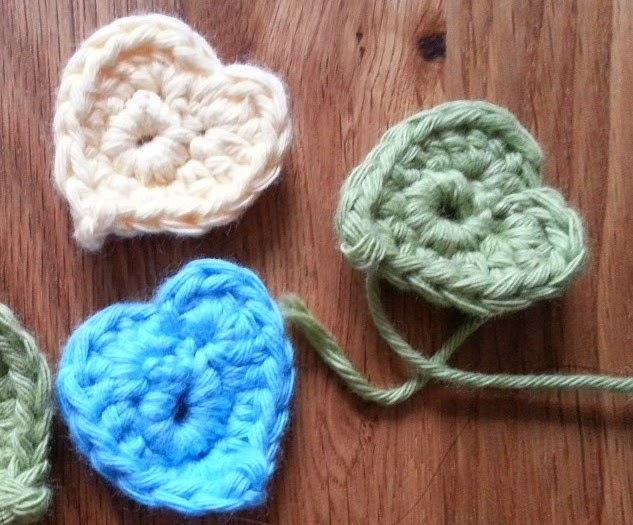 So for a bit of fun I thought I would do a bit of free-form crochet. 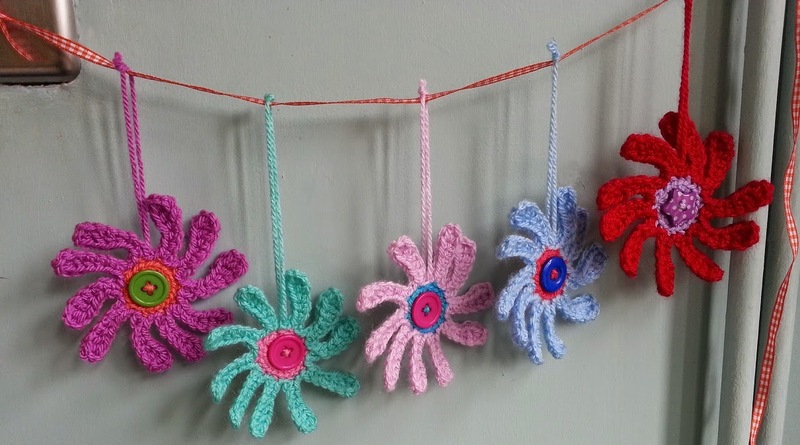 Free-form crochet is where you pick up a hook and just make something! 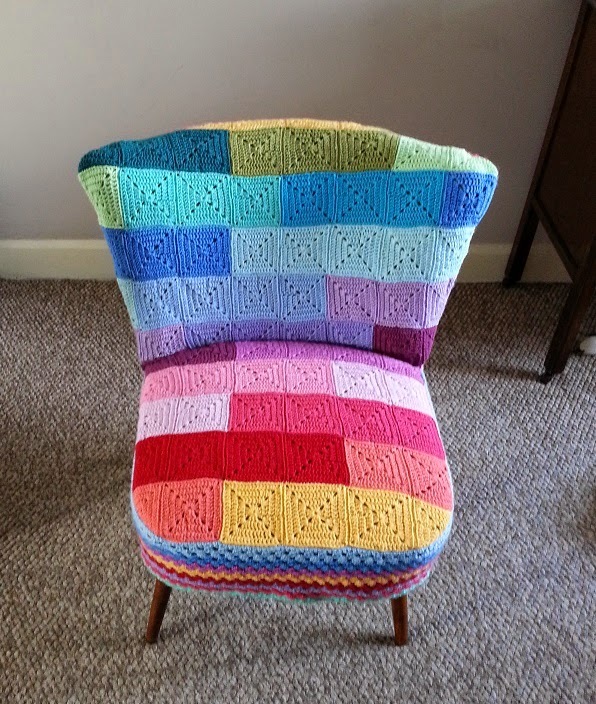 There are some amazing pieces on the internet, big spirally patterns in lovely bright colours. I don't know if the idea is to just let your hooky wander and see where it goes or if you should have an idea in mind first. I've not done much of this before and I find it at least helps if I have an idea of the shape I want first. 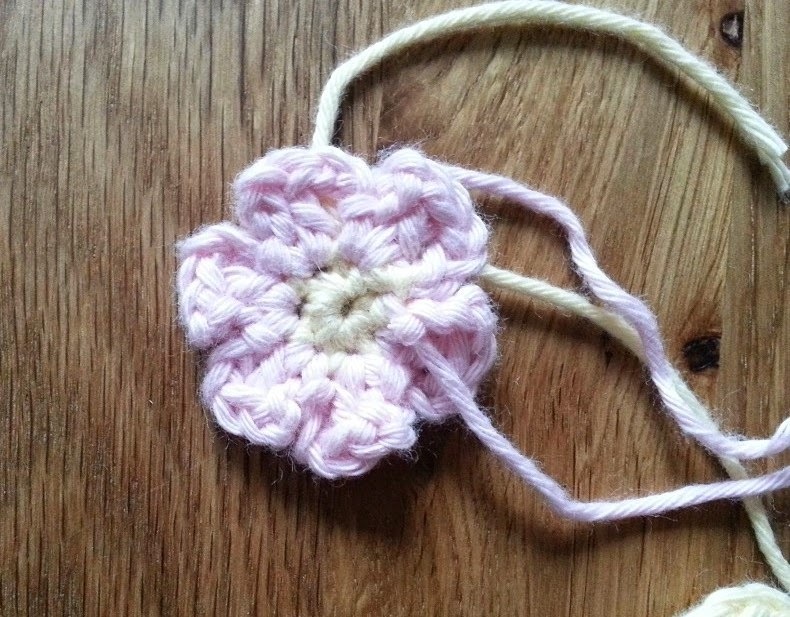 This was the result of my first successful attempt at free-form crochet, a paisley-doily-type-thing that sits on my mantlepiece waiting for a rare vase of flowers. 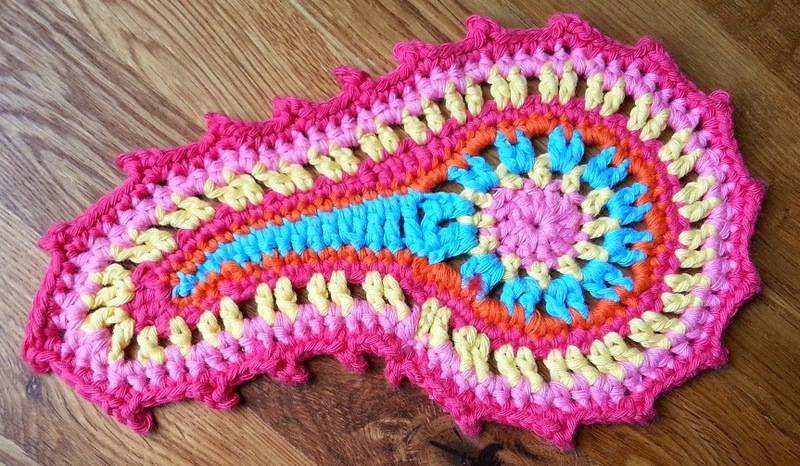 I love paisley patterns and it was an easy shape to do for a beginner. 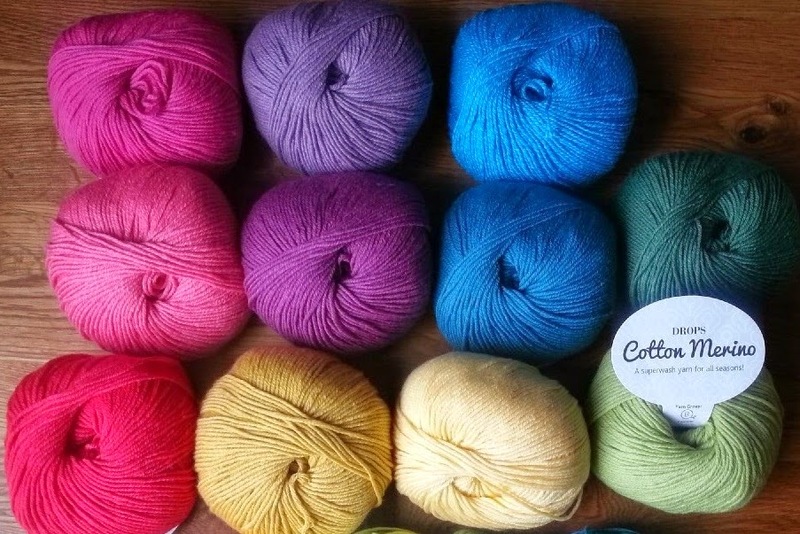 So this morning, I reached for my go-to mucking about yarn, Rico creative cotton. The problem with this yarn is it is an aran weight, so things come out huge and it tends to split for anything intricate. I didn't want to use wooly looking DK acrylic which is the only other type of yarn I've got in lots of colours. 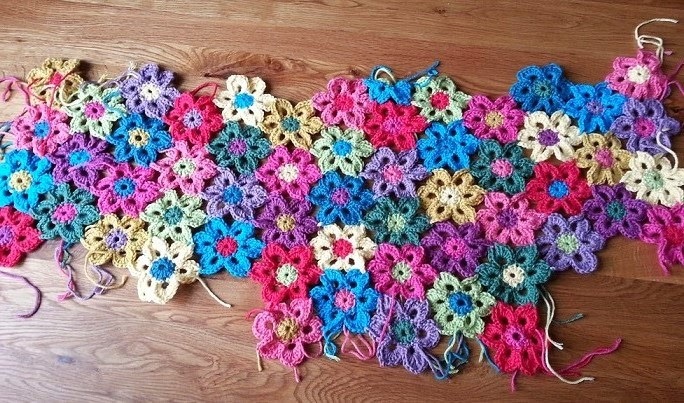 Then I remembered my flower shawl and all those pretty colours! 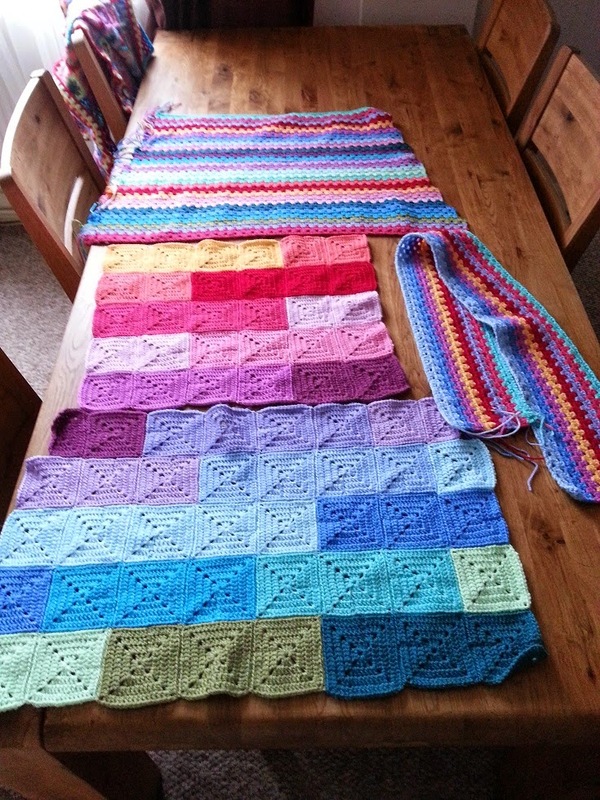 I could spare a little bit of each colour for mucking about, the shawl is quite a bit bigger than that now, it's an old picture so I've got fair bit spare. I've given it a press with some spray starch but it is still quite floppy so I will be giving it the heavy duty pinning and PVA glue treatment shortly. Edit: It has found a temporary home!